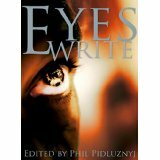 I have enjoyed reading the work produced by previous students on this creative writing course run at Central College in Nottingham so was happy to buy Eyes Write on its release and get a chance to sample the work of writers who might not have been published before. This anthology is a mix of stories, non-fiction and poetry and starts with a great foreword by Phil Pidluznyj which gives an idea of what the course has covered and makes me want to go on it myself. Till it Happens To You by Holly Cassidy is a great tale of sibling rivalry, hatred and jealousy and of the mighty having been fallen by the plotting of an evil twin. This is only a short story but it is tightly written and the author gets the feel of this story over to the reader very quickly. Pools of Light by E R Lambe is a beautiful story set in India and what comes across straight away is how well the author knows, and loves, India. The descriptions are vivid and the feelings expressed so very real. Packed full of interesting morsels I believe this author is planning on expanding this into a novel, a plan I would heartily encourage. The next piece of work is non-fiction and is called Living with Bipolar Disorder by C J Williams. With this being a true story the author gives great insight into a disorder that I am aware of but know very little about. Hearing about it from a sufferer’s point of view was fascinating. The piece ends on an upbeat note and I wish the author all the best for the future. Follow Me Into The Night by Elara Sanderson is a fantastical tale of Rhea who has to leave the safety of her castle and go to the Dark Forest which, we are told, ‘holds creatures far more chilling than those bound between the pages of a fairy tale.’ This isn’t my usual choice of reading material but there are great descriptions in this work which really build the world the author is creating, along with the fear. I enjoyed Room 806 right from the entertaining introduction by Gwilym Moore. The start with the morning after the night before was painful to read it was that easy to imagine but life doesn’t get any easier for the protagonist as life becomes complicated and he has no idea what is going on. Secrets of the Country House by D M Knight was intriguing. An amnesiac finds a diary and there’s a great build-up of mystery as she reads it and finds the contents unsettling. I really liked how this was written and the gradual unspooling of the story but won’t say anything more, for fear of giving spoilers, but I will add that it has a terrific ending. There then follows three poems by Diane Christian, A Friend, A Rose and Choices. I can’t write poetry at all so am always impressed by those who can and I’m pleased to see that Diane is hoping to publish a book of faith poetry. Holly Cassidy has written 21 Haikus which are tasty snippets of dark and light and everything in between. These are followed by an entertaining verse by Ian Sherris, a poem about The Willow Tree by Summer Auden Smith and another from the prolific Holly Cassidy called Once Upon A Time and the book ends with two lovely Haikus by ER Lambe. What a talented bunch! Great review! Sounds like some very talented writers. Thanks Barb. I do like reading these anthologies, getting a flavour of the different styles of writing and seeing what ideas the authors come up with, it’s so interesting. Thanks Alison. It’s amazing what these students have achieved in 10 weeks! Lovely review Georgia, thanks for your comments! You’re welcome Ian, it’s lovely to see you here and I appreciate the comment.